Car Photo of the Day: Rally Check-in. No. This is not this year’s check-in for the Monte Shelton NW Classic, but a past year. It always looks the same though as it happens in the exact same spot, and many of the same cars participate each year… so I could have lied to save face. I’m too honest for my own good sometimes. So here’s a little distraction to while away the day while I work… at work, on my deck, on making BioDiesel, or whatever else is keeping me from writing up the story of our rally. Can you name all the cars in this picture. SIX are visible enough for an ID from an expert car-spotter. Try your hand in the comments. 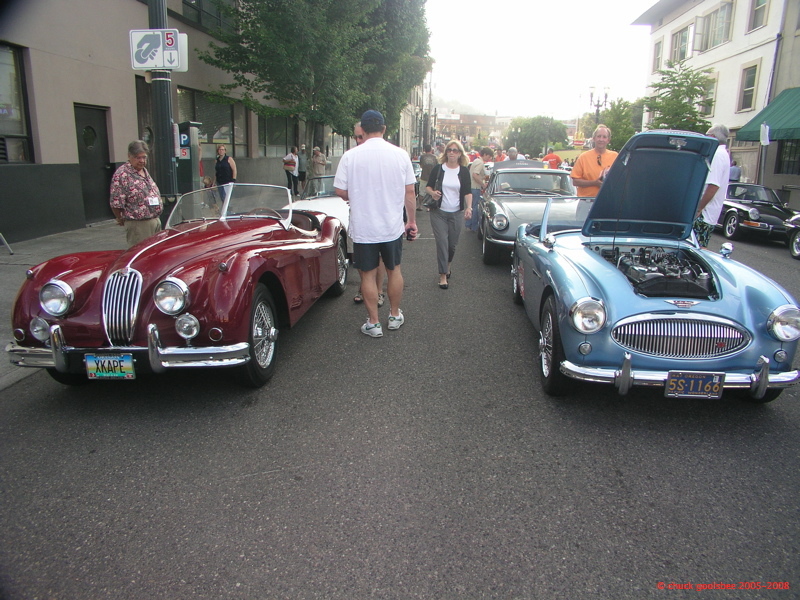 Front row, L2R: Jag 140, A-H 100-6, an E-Type (not sure which, an OTS or FHC, can only see a tiny bit of rear wing). Rear row, L2R: TR-4 or 6, Ferrari 330 GT, Porker 911. Next Next post: Car Photo of the Day: Composition is everything.